For other uses, see World Building. Worldbuilding is the process of constructing an imaginary world, sometimes associated with a whole fictional universe. The term "world-building" was first used in the Edinburgh Review in December 1820 and appeared in A.S. Eddington's Space Time and Gravitation: An Outline of the General Relativity Theory (1920) to describe the thinking out of hypothetical worlds with different physical laws. The term has been used in science fiction and fantasy criticism since appearing in R.A. Lupoff’s Edgar Rice Burroughs: Master of Adventure (1965). The resulting world may be called a constructed world. Developing an imaginary setting with coherent qualities such as a history, geography, and ecology is a key task for many science fiction or fantasy writers. Worldbuilding often involves the creation of maps, a backstory, and people for the world. Constructed worlds can enrich the backstory and history of fictional works, and it is not uncommon for authors to revise their constructed worlds while completing its associated work. Constructed worlds can be created for personal amusement and mental exercise, or for specific creative endeavors such as novels, video games, or role-playing games. The creation of literary fictional worlds was first examined by fantasy authors such as George MacDonald, J. R. R. Tolkien, Dorothy L. Sayers, and C. S. Lewis. Tolkien addressed the issue in his essay On Fairy Stories, where he stated that the "Secondary World" or "Sub-Creation" (the constructed world) is substantially different from the art of play-writing: "Very little about trees as trees can be got into a play." Constructed worlds shift away from storytelling, narrative, characters and figures, and may explore "trees as trees" or aspects of the world in-and-of-themselves. Later analysis of fantasy worlds in the 1960s contextualized them in the medium or the narrative of the works, offering an analysis of the stories in the world, but not the world itself. Media franchises are similar to constructed worlds but do not necessarily rely on them; for example a media franchise such as Star Wars has a constructed world, while The Beatles, as a franchise, does not. In the 2000s, world-building in film has increased in popularity. When before, writers sought to create a character that could sustain multiple stories, now they create a world that can sustain multiple characters and stories. Worldbuilding can be designed from the top down or the bottom up, or by a combination of these approaches. The official world-building guidelines for Dungeons and Dragons refer to these terms as "outside-in" and "inside-out," respectively. In the top-down approach, the designer first creates a general overview of the world, determining broad characteristics such as the world's inhabitants, technology level, major geographic features, climate, and history. From there, he or she develops the rest of the world in increasing detail. This approach might involve creation of the world's basics, followed by levels such as continents, civilizations, nations, cities, and towns. A world constructed from the top down tends to be well-integrated, with individual components fitting together appropriately. It can, however, require considerable work before enough detail is completed for the setting to be useful, such as in the setting of a story. With the bottom-up approach, the designer focuses on a small part of the world needed for his or her purposes. This location is given considerable detail, such as local geography, culture, social structure, government, politics, commerce, and history. Prominent local individuals may be described, including their relationships to each other. The surrounding areas are then described in a lower level of detail, with description growing more general with increasing distance from the initial location. The designer can subsequently enhance the description of other areas in the world. This approach provides for almost immediate applicability of the setting, with details pertinent to a certain story or situation. The approach can yield a world plagued with inconsistencies, however. By combining the top-down and bottom-up approaches, a designer can enjoy the benefits of both. This is very hard to accomplish, however, because the need to start from both sides creates twice as much work, which may delay the desired product. Despite requiring considerable work to develop enough detail for a setting to be useful, not every aspect of a setting can be explored, and instead an approach called inferred world building is often used. Inferred world building is when the author provides enough detail about the various parts of a setting that readers can extrapolate on what is written to come to their own conclusions regarding specific details that weren't provided. This is especially useful for roleplaying game settings, as individual games may require certain details to be created on a case-by-case basis for the RPG's story to function. From a game-design perspective, the goal of worldbuilding is to create the context for a story. Consistency is an important element, since the world provides a foundation for the action of a story. However, J. R. R. Tolkien described the goal of worldbuilding as creating immersion, or "enchantment" as he put it, and descriptions of the world can be wholly disconnected from the story and narrative. An uninhabited world can be useful for certain purposes, especially in science fiction, but the majority of constructed worlds have one or more sentient species. These species can have constructed cultures and constructed languages. Designers in hard science fiction may design flora and fauna towards the end of the worldbuilding process, thus creating lifeforms with environmental adaptations to scientifically novel situations. Perhaps the most basic consideration of worldbuilding is to what degree a fictional world will be based on real-world physics compared to magic. While magic is a more common element of fantasy settings, science fiction worlds can contain magic or technological equivalents of it. For example, the Biotics in the science fiction video game series Mass Effect have abilities, described scientifically in-game, which mirror those of mages in fantasy games. In the science fiction novel Midnight at the Well of Souls, magic exists, but is explained scientifically. Some fictional worlds modify the real-world laws of physics; faster-than-light travel is a common factor in much science fiction. Worldbuilding may combine physics and magic, such as in the Dark Tower series and the Star Wars franchise. Constructed worlds often have cosmologies, both in the scientific and metaphysical senses of the word. Design of science fiction worlds, especially those with spacefaring societies, usually entails creation of a star system and planets. If the designer wishes to apply real-life principles of astronomy, he or she may develop detailed astronomical measures for the orbit of the world, and to define the physical characteristics of the other bodies in the same system; this establishes chronological parameters, such as the length of a day and the durations of seasons. Some systems are intentionally bizarre. For Larry Niven's novels The Integral Trees and The Smoke Ring, Niven designed a "freefall" environment, a gas torus ring of habitable pressure, temperature, and composition, around a neutron star. Fantasy worlds can also involve unique cosmologies. In Dungeons and Dragons, the physical world is referred to as the Prime Material Plane, but other planes of existence devoted to moral or elemental concepts are available for play, such as the Spelljammer setting, which provides an entirely novel fantasy astrophysical system. Some fantasy worlds feature fictional religions. The Elder Scrolls series, for example, contains a variety of religions practiced by its world's various races. The world of the 2000 video game Summoner has a well-developed cosmology, including a creation myth. Map construction is often one of the earliest tasks of worldbuilding. Maps can lay out a world's basic terrain features and significant civilizations present. A clear, concise map that displays the locations of key points in the story can be a helpful tool for developers and audiences alike. Finished creative products, such as books, may contain published versions of development maps; many editions of The Lord of the Rings, for example, include maps of Middle-earth. 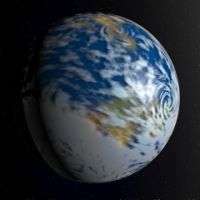 Cartography of fictional worlds is sometimes called geofiction. The physical geography of a fictional world is important in designing weather patterns and biomes such as deserts, wetlands, mountains, and forests. These physical features also affect the growth and interaction of the various societies, such as the establishment of trade routes and locations of important cities. Desire for control of natural resources in a fictional world may lead to war among its people. Geography can also define ecosystems for each biome. Often, Earth-like ecology is assumed, but designers can vary drastically from this trend. For example, Isaac Asimov's short story "The Talking Stone" takes place in a world where silicon, rather than carbon, is the basic building block of life. Some software programs can create random terrain using fractal algorithms. Sophisticated programs can apply geologic effects such as tectonic plate movement and erosion; the resulting world can be rendered in great detail, providing a degree of realism to the result. Constructed cultures, or concultures, are a typical element of worldbuilding. Worldbuilders sometimes employ past human civilizations as a model for fictional societies. The 1990 video game Worlds of Ultima: The Savage Empire, for example, takes place in a world full of tribes based on civilizations in early Mesoamerica and Africa. This method can make a fictional world more accessible for an audience. Simon Provencher has stated as a 'Golden Rule' of Worldbuilding that "... unless specified otherwise, everything inside your world is assumed to behave exactly as it would in the real world." Another example is Steven S. Long, a representative of the Champions role-playing game, who stated that "Everything that happened in the real world has also unfolded in the exact same way in the Champions Universe." This means any past wars, elections, and technological advancements in our world occurred the same way in the Champions Universe unless explained otherwise. Creating a cohesive alien culture can be a distinct challenge. Some designers have also looked to human civilizations for inspiration in doing so, such as Star Trek's Romulans, whose society resembles that of Ancient Rome. The fictional world's history can explain past and present relationships between different societies, which can introduce a story's action. A past war, for example, functions as a key plot point in the Shannara and Belgariad series. Examples of constructed worlds include Terry Pratchett's Discworld, the pseudo-Earth Hyborian Age in the Conan series, Arrakis in the Dune series, Ursula K. Le Guin's Earthsea and Gethen, the Subcontinent of Hayao Miyazaki's Nausicaä of the Valley of the Wind, and Arda, the location of J. R. R. Tolkien's Middle Earth, in The Lord of the Rings. Constructed worlds are not always limited to one type of story. Lawrence Watt-Evans and Steven Brust created Ethshar and Dragaera, respectively, for role-playing games before using them as settings for novels. M. A. R. Barker originally designed Tékumel well before the advent of role-playing games, but many gamers, including Barker himself, have used it as a setting for such games. A shared universe is a fictional universe that can be used by different authors. Examples of shared universes include the Star Wars expanded universe and campaign setting developed specifically for role-playing games. One of the oldest of these is Oerth, developed for the Dungeons and Dragons Greyhawk setting. Forgotten Realms is another such D&D setting, originally a homebrew campaign world by Ed Greenwood. ↑ Hamilton, John (2009), You Write It: Science Fiction, ABDO, pp. 8–9, ISBN 1604535083. ↑ Eddington, Arthur Stanley (1920). Space, Time and Gravitation : an outline of the general relativity theory. Cambridge University Press. ↑ Jeff Prucher, ed. (2006). Brave New Words: The Oxford Dictionary of Science Fiction. p. 270. ISBN 9780199891405. ↑ Stableford, Brian M. (2004). Historical Dictionary of Science Fiction. Scarecrow Press. ISBN 0-8108-4938-0. 1 2 Mark J.P. Wolf (2014). Building Imaginary Worlds: The Theory and History of Subcreation. Routledge. ISBN 9781136220814. ↑ Cook, Monte; Tweet, Jonathan; Williams, Skip (2003). Dungeon Master's Guide. revised by David Noonan and Rich Redman. Wizards of the Coast. ISBN 0-7869-2889-1. ↑ Laramee, Francois Dominic (2002). Game design perspectives. Charles River Media. ISBN 1-58450-090-5. ↑ Anderson, Poul (1991). "The Creation of Imaginary Worlds". Writing Science Fiction and Fantasy. New York: St. Martin's Press. ISBN 0-312-06003-3. ↑ Long, Steven S. (2002). Fantasy HERO (Hero System Fifth ed.). San Francisco: DOJ. pp. 290–294. ISBN 1-58366-016-X. ↑ Clement, Hal (1991). "The Creation of Imaginary Beings". Writing Science Fiction and Fantasy. New York: St. Martin's Press. ISBN 0-312-06003-3. ↑ Provencher, Simon. "The Golden Rule of Worldbuilding". Worldbuilder. Simon Provencher. Retrieved 6 November 2013.